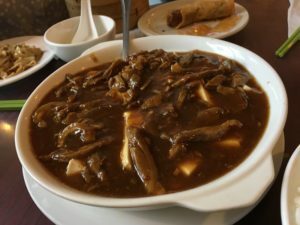 It didn’t take too many visits to Café Orient for it to become my family’s go-to spot for authentic Chinese food. It even usurped my sister and her husband’s favourites, and they’ve been living in Ottawa for the better part of 20 years now! However, up until now I’ve been lax at getting either complete notes and/or matching pictures to actually put a review together. So, when my father was up for a visit, I made a distinct effort to do my blogger due diligence. Café Orient isn’t a big place, seating 50-ish at tables dotted along the narrow restaurant with simply decorated walls. When you’re seated, you’ll be given their two menus to peruse through. One is the main menu, which is voluminous as most Chinese restaurants. 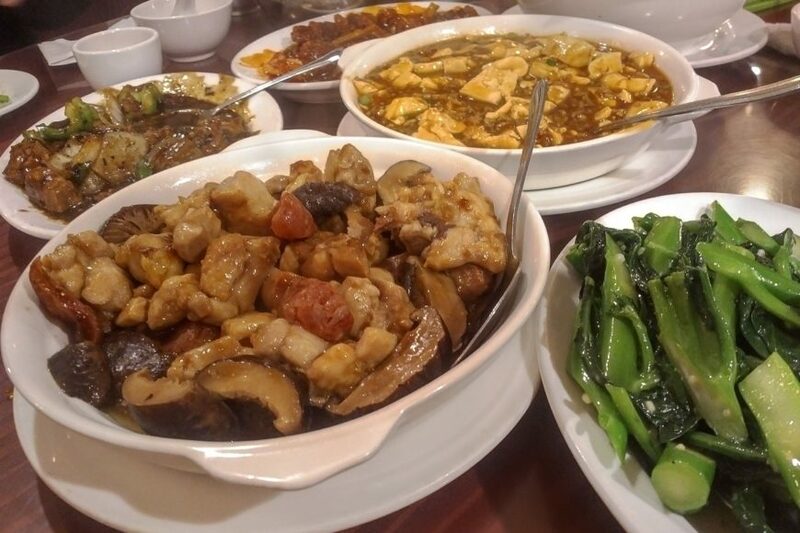 The second is their “Pick your own set dinner” where you can choose from several dozen entrees ($12.75 – $16.00 each) and soup for the table and unlimited steamed rice is included. On our most recent visit, we ordered from both menus. From the set dinner menu we chose the minced chicken and sweet corn soup, Chinese broccoli with ginger (subbed in for garlic), mapo tofu, Cantonese-style beef short ribs, and shredded BBQ duck with XO sauce on tofu. On top of this already hearty meal, we got a couple kid-friendly items like their sweet and sour pork, and veggie spring rolls (two for $3.50), pork steamed buns (six for $6), and because you gotta have them noods, the shredded chicken, pork and BBQ pork with rice noodles ($9.50). The minced chicken and corn soup came first. 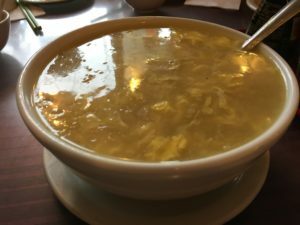 Wispy thread of eggs and strips of tender, velveted chicken make for a hearty starter, and I enjoy the slightly gelatinous viscosity of this soup. Once we were done the first round of soup, the other dishes started to come as they were ready. The veggie spring rolls were crisp and fresh, and while the pork steamed buns were on the small side, they had a good ratio of BBQ pork to pleasantly chewy dough. 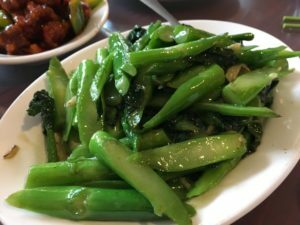 The Chinese broccoli was a vibrant green and perfectly tender-crisp, with bits of ginger adding pops of flavour, but not going over-the-top (as ginger can so easily do). 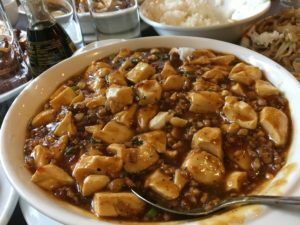 One of our “must eat” dishes now at Café Orient – the mapo tofu – isn’t labeled as such on the menu, instead being called “ground pork and tofu with spicy garlic sauce.” I find the creamy smooth tofu to be the star of the dish, while the pork adds some meatiness – a perfect dish to heap onto clumps of steamed rice, mix together, and then gobble down. It packs some spice but isn’t going to leave you breathing fire. It was our first time trying the chicken and pork noodle dish, and it went over extremely well. 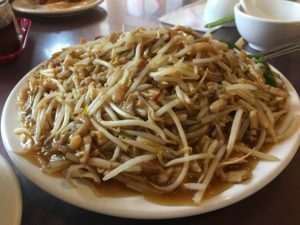 Wide rice noodles were piled high with the aforementioned proteins, as well as bean sprouts, onion and cabbage, in a mildly flavoured sesame sauce. Something I enjoy about Café Orient is that they do an excellent job at cooking their meats; they’re almost always wonderfully tender and moist – a far cry from the overcooked proteins I’ve had in too many Chinese meals over the years. The BBQ duck and tofu didn’t go over quite as well, either due to its distance on the table from most people, or because of the mild funk to it from the XO sauce. I enjoyed it, and the large hunks of tofu, but one man can only do so much damage to a dish when there’s several others to sample. 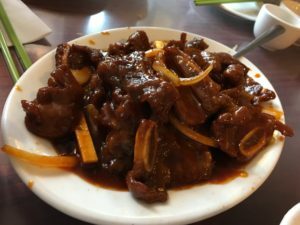 Although the sauce seemed more like a vaguely Chinese version of an American BBQ sauce rather than Cantonese, the beef short ribs made for tasty morsels. The tomatoe-y sauce had a hint of five spice and added sweetness from sautéed onions, while their cross-cut style made them easily chopstick-able. We got tea and rice top-ups throughout the meal, and plates were taken away as we emptied them. The front of house crew at Café Orient knows what they’re doing. Despite the behemoth menu, Café Orient consistently does up some extremely well-executed Chinese food. There’s still plenty on their menu that I want to try, and between this and their dependability, it’s guaranteed that I’ll be back in the future.